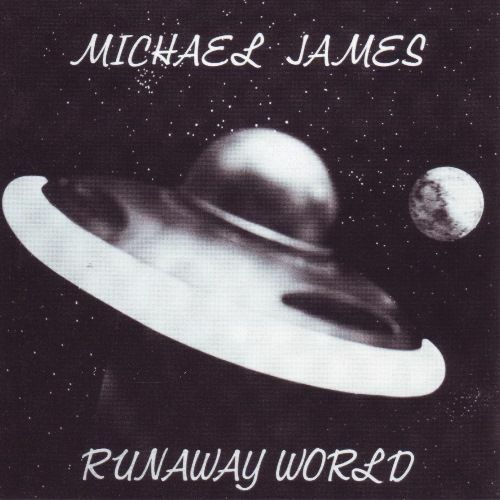 Michael James' locally released 1978 LP "Runaway World" (ASI) has gathered many admirers among aficionados of non-mainstream psych and hardrock in recent years. Michael is still active in the music scene in Minnesota, but found time to discuss his career and the 1978 album in particular when we made contact a few months ago. Q: Was "Runaway World" your first recording session, or had their been earlier work? Were you in bands before? MICHAEL JAMES: I was lead guitar player for the Grasshoppers after they had their top 40 hits like "Sugar & Spice". They wanted to keep up with the heavy sounds that were taking over in the 70s. I also played with a local (Minnesota) acid rock cover band called "Inner Sanctum" where I wrote the half dozen original tunes we did, including "She's Got You" & "Thank You Ted". Runaway World was my 1st real studio recording, otherwise we used 8 channel Teacs w/10 inch reels to record demos and prep for studio time. Q: Were there any records released from the Inner Sanctum period? MICHAEL: No official recordings, but I have several 10 inch reels with other versions of "Runaway World" and many unused songs and comedy sketches spanning 15 years and all 3 bands from the 70s and 80s. We're trying to find a machine that will play them and the original 1/2 track of "Runaway World". When we get caught-up recording the new CDs we'll get back to figuring all that stuff out. I also have sci-fi stories I've written and had 2 publishers interested in a 3 story book titled "Children Of The Risk"! They wanted me to reformat the stories and re-submit them, but a divorce and other endeavors got me off track. We have a college student working on putting them all together (they're on an old word processing program and come out all run together so it's a several month project) and will most likely publish ourselves and look for a book(s) deal. Q: The "Runaway World" LP is an elaborate work that sounds like some time and $$$ went into it. How did it come about, and what were the circumstances during which the LP was made? MICHAEL: A friend (Rick Dwinnell) was really into controlling sound both live and recording, and he became our "Tech Master". My cousin (Bob Berg) loved acid rock and had cash so he became our Producer. The drummer, bass and keyboard players were friends from the band "Natural Life" also on ASI label. I wrote (half were tunes we were doing and half were new) and we practice recorded all day (and often night) for 6 months to get ready. The actual studio time was 1 week! 95% of the tracks are 1st and only run. The mix took the longest as usual. Q: Did you play live around this time? Was any of the LP material performed? MICHAEL: Mostly party or bar performances with "Inner Sanctum" and then later with the popular hard rock cover band "City Knights". Q: The "Guatemala" references on the LP are a bit puzzling... anything that can be thrown light on today? Q: "Sleepers" is an interesting track with it's psychedelic effects -- any particular comments on that one? Q: Another great track is the closing "Listen, freedom is at hand" -- what are the lyrics about? Any other thoughts on it? MICHAEL: People tend not to like my answer to this, but it's a spiritual song about a "near death experience". Q: Any other tracks on the LP you like to comment on? How do you feel about the album all over today? MICHAEL: I think the song I like best today and still play in an updated form is "You Don't Walk On My Street". It's still a rock classic to many fans and me. Q: The LP has a cool front cover; could you say something about it? MICHAEL: My father was a newspaper and then an advertising photographer and he took all the shots (a 10 hr session, he was such a perfectionist!). It took 7 overlays for the front and 3 for the back. The planet is a greased cue ball and the ship is an "Arid deoderant spray top", a circular tube kitchen light and a 12" JBL speaker from my "Fender Twin Reverb" amp. Q: How many copies were pressed, and how was the LP distributed? Did you promote it in any way? MICHAEL: I had 1000 made and had several stations play cuts in MN. We also had it in several local "Head Shops". I don't know exactly how many ASI made and distributed for sure, but we believed it was in at least 16 cities. I have heard from people in several other countries that it made it's way to and several stations that played it. We sued ASI and won, but the bank claimed "off-set" so we couldn't get cash out of them. The owner died a few years later and the company folded, so we'll never know. Q: Did the LP receive any recognition at the time of the release? Was their any media coverage? Q: What would you say were your major influences at the time of "Runaway world"? Q: Did you work full-time as a professional musician? MICHAEL: Off and on, as much as possible, it was usually wanting more equipment than the bands or I could afford that drove me to other employment when I did outside jobs. Q: Could you say something about your musical career and work during the 1980s & 1990s? MICHAEL: I played with a bar band called "City Knights", wrote several songs, recorded a solo cassette in the mid 80s as "Michael James" just before CDs took off. Q: What are your current activities in music? MICHAEL: I am CEO of Empath Records Inc and have a band called "Children Of The Risk". My brother is running distribution and we're working with a new "Tech Head" who will also be performing live with us when we get done recording. We have 16bit demos out now and will be recording 2 new CDs (1 w/Children Of The Risk and 1 w/Michael Yonkers from SubPop) starting in August 2004 when we get delivery of our new "Alienware" Pro Digital Studio. We have some popular MP3 download sites and a couple of labels waiting for our "next level". We're also looking into cutting LPs next year, but we need to do the new recording and get the next CDs out 1st.